PE-SR405TN-STRAIGHT part number from Pasternack is a RG405 Tinned coax cable that is semi-rigid. 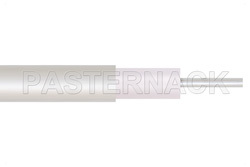 Pasternack RG405 Tinned semi-rigid coax cable is 50 Ohm and has a PTFE dielectric.RG405 Tinned coax has a shield count of 1 and the maximum frequency for this Pasternack cable is 40 GHz. RG405 Tinned coax cable has an attenuation at 1 GHz of 22 dB.